I was starting to wonder if it was going to happen. At 6 3/4 big man has finally lost a tooth last week. He was beaming from ear to ear when he presented me with this on finishing school. I then had a very intricate story of how it fell out and how surprised his entire class were. Apparently one of the girls had informed him that the tooth fairy leaves a whopping £2 on her first visit. Queue moans of the rate of inflation from me and my husband. You could see big man planning his trip to the sweet shop. At night he put his tooth in a special cushion and stuffed it to the side of his pillow. 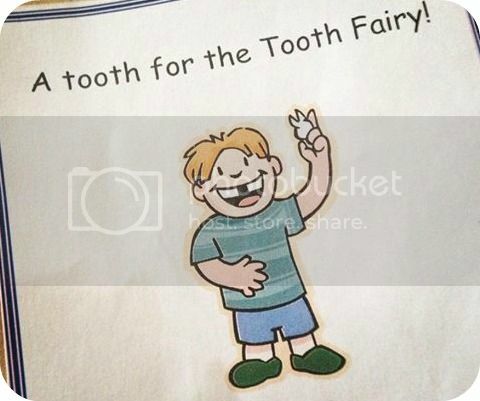 We didn't want the tooth fairy having a tough time finding it. The next morning excitement was high. His friend had been right and he also received a note. Wow Big Man! You have taken such good care of your teeth. Well done! I noticed on my way in that you have a keepsake book on your wardrobe. On this occasion please put your tooth in there. Don't worry though you are still rewarded. Please don't spend all of it on sweets. They are bad for teeth. After a discussion that I had forgotten all about that book, we went to the top of his wardrobe and found the pouch for his tooth. We then agreed that he should probably wait until a new tooth fell out before he wrote a reply. With that he set to trying to find a new tooth to wobble. Oh it's such a magical time isn't it. Wish our tooth fairy had written a note - what a great way to remember the date. My boy has a special tooth pillow and had been waiting to use his for ages. Now he keeps wobbling his next tooth. I was told the going rate was £10 for a first tooth! Needless to say ours also bought £2 for the first. Cool. I take it the tooth mouse deals in euros? Yes apparently they do. He might get a different one if he loses one when Lara is on holiday. Aw, such a big moment losing a first teeth. Love the note. I will dread it when it is little man! awww Louise bless him! .. Lara is more generous than the one that visits here! She won't be that generous next time!